Edamame are immature, green soybeans still in the pod. 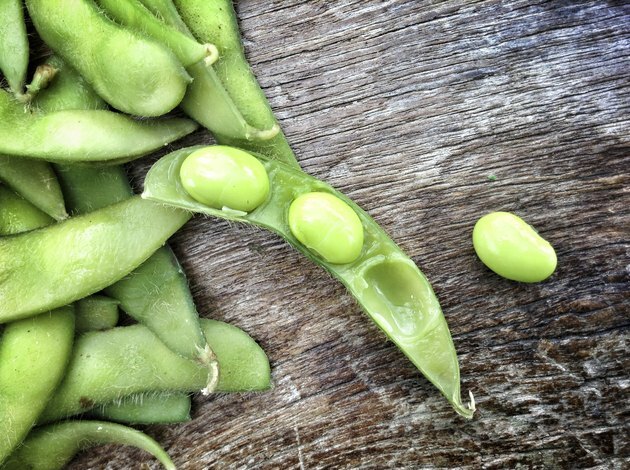 Available fresh or frozen, edamame can be boiled whole, then shelled and eaten as a snack or added to stir fries, soups or salads. Edamame have much of the same nutritional benefits as other soy products such as tofu or soy milk. However, soy contains compounds that some animal studies -- including one 2006 study conducted by the National Institute of Environmental Health Sciences -- suggest may cause reproductive problems if eaten in excess. To maximize the benefits, limit yourself to one serving of soy daily. In 2005, a study published in "The American Journal of Clinical Nutrition" reported that people following a high-protein, low-fat diet experienced less hunger between meals and were successful at losing significant amounts of weight. Edamame is both high in protein and low in fat. A 1-cup serving of the cooked beans has 17 grams of protein, an amount that supplies 30 percent of a man's required protein intake per day and almost 37 percent for a woman. Each cup also contains 8 grams of total fat and less than 1 gram of saturated fat. Edamame contains 8 grams of fiber in every cooked cup. For a man, this is over 23 percent of his recommended daily intake; for a woman, it's 28 percent of her requirement per day. According to the American Heart Association, consuming fiber-rich foods can lower your risk of heart disease. In addition, edamame has a high concentration of alpha-linolenic acid, or AHA, an omega-3 fatty acid that your body can convert to EPA and DHA, compounds linked to lower blood cholesterol and a decreased risk of stroke and heart disease. Each cup of cooked edamame contains about 1.6 milligrams of manganese, or over half of the recommended daily intake for adults. Your body needs manganese to build strong bones. A serving of edamame provides over 20 percent of an adult's recommended dietary allowance, or RDA, of vitamin K, a nutrient that the Harvard School of Public Health reports is crucial for increasing bone density. The beans are also high in potassium and magnesium, supplying at least 10 percent of the RDA of each mineral for both men and women in a single cooked cup. If you lack enough of either, you may have an increased risk of osteoporosis. Your body needs copper to keep your immune system healthy and functioning properly. Adults need 900 micrograms of copper each day, and a 1-cup serving of cooked edamame contains 535 micrograms of the mineral, or approximately 60 percent of the required daily intake for men and women. Edamame contains a high concentration of the phytoestrogens genistein and daidizein, compounds that mimic the behavior of estrogen in the body. The University of Maryland Medical Center reports that these phytoestrogens may be able to lower your risk of certain types of cancer, though more research is needed.